George Salapatas was born on the 20th November 1925, in Chicago, Illinois USA, of Greek descent, and as George Barris was known as a car designer, famous for building automobiles for Hollywood, such as the Batmobile and Munster Koach. Thanks to his designing skills and car knowledge, Barris’ net worth significantly increased. His career was active from the 1940s until 2010. He passed away in 2015. Have you ever wondered how rich George Barris was at the time of his death? According to authoritative sources, it has been estimated that Barris’ net worth was high as $10 million, an amount earned through his successful career as a car designer. George Barris was born into the family of Greek immigrants; when he was three years old, his father sent him and his brother Sam to live with their uncle in Roseville, California. George developed an interest towards cars from an early age, so at seven he was already making car models and winning contests. George and Sam worked at the Greek family restaurant, and saved enough to buy their first car, a 1925 Buick that wasn’t in a good shape, but the brothers quickly improved its condition, inserted a few modifications, and later sold it for a profit – it was George’s first custom car of many. Barris went to San Juan High School, and although his family wanted him to stay and work at the restaurant, Barris decided to move to Los Angeles, and at 18 years of age, opened Barris Custom Shop . After being discharged from the army, Sam joined his brother in L.A., and they started working on custom cars for private buyers, before somebody from the movie industry noted their skills. They were asked to design cars for Hollywood stars and executives, but also as props for films – their first one used in a movie was in “High School Confidential” in 1958. Barris subsequently designed the Ford police car featured in the movie “North by Northwest” in 1959, and a modified Plymouth Barracuda for “Fireball 500” (1966), a Mercury station wagon for “The Silencers” (1966), Dodge Charger for “Thunder Alley” (1967), created a vehicle for “Supervan” (1967), and Lincoln Continental Mark III for “The Car” (1977). All of these ventures increased George`s net worth by a large margin. However, Barris’ most notable work came when the ABC executives asked him to create a signature car for the TV series “Batman” (1966-1968). He didn’t have enough time to build a new car from a scratch, so instead George used his Lincoln Futura as a base, but the Batmobile was an international hit and stayed under Barris’ ownership until he sold it at auction for $4,620,000 in 2013. Selling this famous vehicle generated a large contribution to his net worth. George meantime constructed and modified cars for such celebrities as Zsa Zsa Gabor, Bob Hope, Elton John, Ann-Margret, Bing Crosby and Glen Campbell. He also modified a Pontiac station wagon for John Wayne, a Cadillac limousine for Elvis, Cadillac Eldorado for Dean Martin, and in 1966 Ford Mustang convertibles for Sonny and Cher, increasing further his net worth. Latterly he worked on a Toyota Prius for The New York Times in 2005, and did a special design of a 2010 Chevrolet Camaro Spirit, which also added to his net worth. Regarding his personal life, George Barris married Shirley Nahas in 1958, and were together until her passing in 2001; they had two children together. 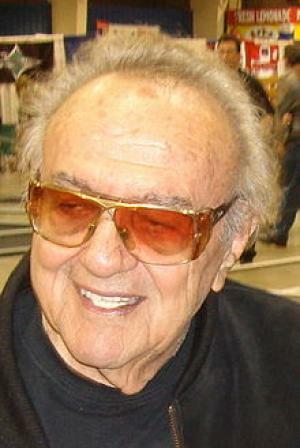 George Barris died in his sleep at home in Encino, California, in November 2015. 2 Well known builder of hot rods and custom cars, such as the Batmobile from Batman (1966) and the truck from The Beverly Hillbillies (1962). 2000 Life Career Award Academy of Science Fiction, Fantasy & Horror Films, USA Designer of film and TV's Batmobile.